Blogger, journalist, writer – what’s the difference? When I decided to do media and journalism at uni, it was because I wanted to be a writer. I didn’t feel comfortable with the word ‘journalist’ – somehow, it had become almost a dirty word at the time, associated with the sad stereotype of Lois Lane-esque newspaper reporters who would step over anyone to get a story. I knew I didn’t want to be that kind of journalist, and subconsciously, in my mind I was always going to be a ‘writer’ – less Lois Lane, more Carrie Bradshaw; maybe becoming an author later on, fingers crossed. Again, this is a stereotype, and a bit of a romanticised one, but one I felt far more at ease with. Thankfully, I was learning at a time when suddenly everything was online. Once out of uni, I could see that working in print for one of the glossies I’d grown up reading was unlikely (I couldn’t just tweet the editor back then), and applying for remote online roles such as my freelance job reviewing for View London was less intimidating, more attainable, and the kind of thing I could enjoy. It was the equivalent of sending an email instead of making a phone call for me – I felt more confident about it. And so my online career began. Online journalism has changed things, and blogging has changed them even more. There are so many blogs out there, brilliant blogs full of inspiration, great photos, niche topics, passions for anything from beauty to social media and everything in between. Anyone can set up a blog and put their thoughts out there. Bloggers can even call themselves ‘editors’, because given that it’s their site, they are. Anyone can be a writer, or as people tend to quip cheerfully while metaphorically stabbing you in the heart, ‘everyone’s a writer these days’. So where does that leave… writers? While it’s in part a generational thing, I’ve found there still seems to be the general misconception that if you write online, you’re a blogger, while if you write for print, you’re a journalist. When I tell people I’m a journalist, they ask what paper or mag I write for; when I say I’m a writer, they look at me like I must be penniless, whiling away my time in a dark room with a typewriter and endless coffees to try and crack out a novel. If I say I’m an online journalist, I feel like I’m already putting down what I do as less important than traditional journalism – do I need to add the ‘online’? Referring to ‘my blog’, I feel a bit like a spotty student who hasn’t made it yet, but when I say ‘my website’, I think they must imagine a huge online magazine which isn’t right either. Labels don’t matter, and I’m certainly not criticising any of the media here because I work online and offline and love it; but in an industry where it literally is not about what you know (qualifications seem to mean less and less) and so much about who you know (name a successful journalist/intern/writer who isn’t on Twitter and busily networking) and what you’re already doing (successful blog? You might be the next big thing), writing seems to be almost so common that it’s not valued as ‘journalism’ anymore. The web has opened it up to everyone. Now, there’s a new generation – my generation – so full of bloggers and writers that it’s hard to see who the next Charlie Brooker, Caitlin Moran or Hadley Freeman is. It’s no bad thing that so many people are now writing; but I do worry that the journalism industry is getting a little lost somewhere – not helped by these ‘celebrity columnists’ who are actually, er, TV presenters and such and are probably taking a job that a trained journalist could do better. Are they journalists too now? For me, it’s not a question of fame, but of originality; my ultimate goal is for people to recognise my writing, to love my writing and to look out for it – how many people can you say that of? I follow hundreds of journalists, but only a couple spring to mind that have a real way with words that no one else has – and yes, I’m including bloggers in that. And no, I don’t think I’m one of them! Label-wise, I’m probably all of the above; I’m a journalist, which I feel more confident in saying thanks to my work in print (there I go again); I’m a blogger, because I’m here and elsewhere doing just that; I’m a writer, in that I write the odd little story (one day a novel, when real inspiration comes); and I’m a copywriter thanks to my main job because it’s part editorial, part marketing. So is there even a difference – are all online writers ‘bloggers’? Are bloggers becoming journalists? 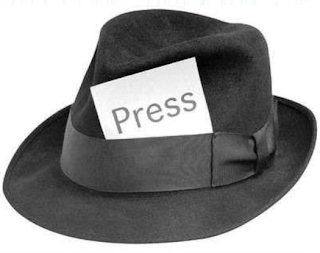 Are journalists old news? What do you define them as or is a label just a label? This entry was posted in blogging, journalism, media, writing. Bookmark the permalink. Really interesting post! I’ve been doing this for a few years now, and I still don’t know what to call myself when people ask. I’ve avoided calling myself a journalist because I’m not trained as one and I know this upsets other trained journalists. People tend to roll their eyes when I say blogger (imagining that I write a post then faff about all day) or editor. So I tend to plump for ‘freelance writer’. After all, I spend most of my time writing! Really well written, you’re a talented writer! Thank you both girls, really appreciate it!